On June 1, 1969, the administration at Central Michigan University took a proactive step to improve diversity at CMU. President William Boyd hired Dr. Robert A. Thornton, a dean and professor of physics at San Francisco State University, to be a racial affairs consultant at the University. Dr. Boyd came to Mt. Pleasant from UC Berkeley in the summer of 1968 and, as he noted in a 2014 oral history interview, CMU struck him as a relatively homogeneous campus made up mostly of white students from Michigan. Before Dr. Thornton came to campus, strides were already underway to improve curricular offerings in African-American studies. Just a few months into Dr. Boyd’s tenure, CMU convened the "Ad-Hoc Committee on Black Experience" with a charge of developing curricula and programming dedicated to exploring and informing the CMU community on matters of black culture. Additionally, the History Department was given permission to fast-track filling positions with professors to teach African-American history courses, and other departments, including English and Political Science, were encouraged to bring forward proposed courses that would incorporate the emerging discipline of African-American studies. But Dr. Boyd knew that expanding curricular offerings in the humanities and social sciences was not enough. He drew upon his Bay-Area connections and requested that Dr. Thornton come to CMU to serve as a special assistant. His charge was "to help departments develop courses related to black studies, establish better relationships with predominantly black high schools, and recruit black students and faculty members." Dr. Thornton was a distinguished physicist and administrator who knew academia very well. He also came from San Francisco State University, which gave him a particular insight into the development of black studies curricula – only five months earlier, San Francisco State had officially created the first Department of Black Studies in the country. Dr. Thornton was a man familiar with the cutting edge of the black studies movement and he was asked to impart his knowledge to the CMU community. Dr. Thornton arrived in Mt. 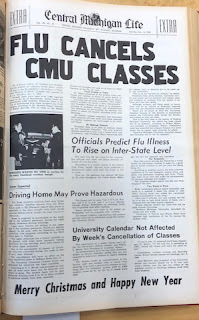 Pleasant on June 1, 1969 and stayed at CMU for two months. He then returned for another two weeks during the following winter break. The programming developed by the administration, with the help of Dr. Thornton, resulted in several changes on campus directed at the African-American community and those interested in black studies. The University sponsored a Black Symposium, bringing black scholars and artists to campus to give students on the majority-white campus insight into black culture. Another initiative was the creation of the African-American Cultural Center in 1969-70. 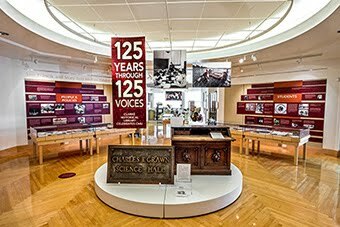 It was established in the "Old Library," known today as Ronan Hall, as a place for all students on campus to go, but specifically geared toward African-American students for academic resources, cultural programming, and a location for studying. Just one year later, students, faculty, staff, and administration developed programming for the first African-American History Week at Central in 1971 with various performance art exhibitions, forums, and guest speakers aimed at increasing awareness and a sense of community at CMU. Not all of the efforts undertaken during the Boyd administration resulted in success. Despite an effort to recruit African-American faculty, in 1974, ten of the 604 faculty (1.6%) identified as minority with eight African-American faculty members or 1.3% of the total faculty. The course in History about the African-American experience was taken off the books after only year because the university could not find a qualified instructor. 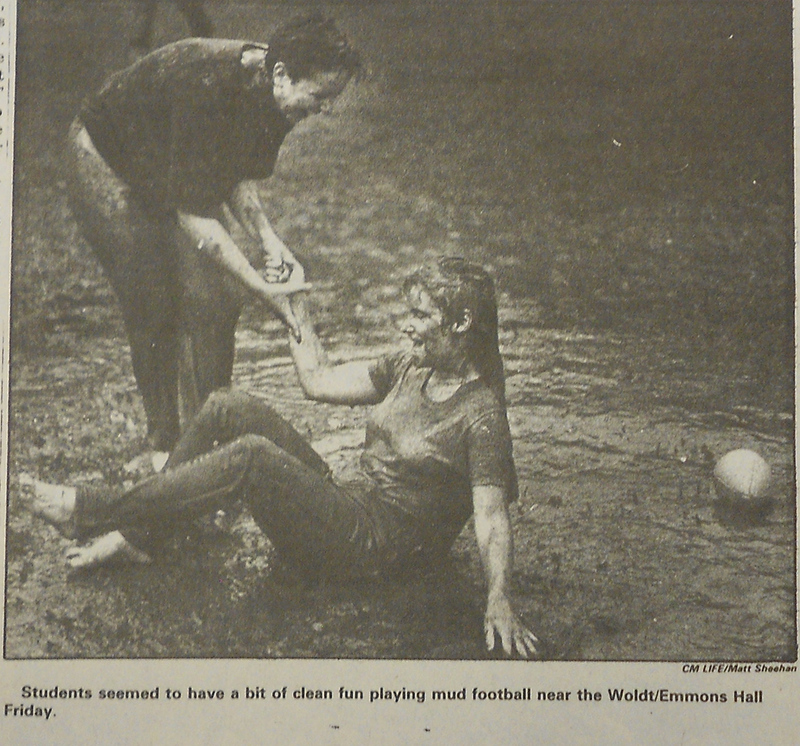 In the years immediately following Dr. Thornton’s time on campus, small and meaningful steps were taken to improve diversity and cultural understanding. 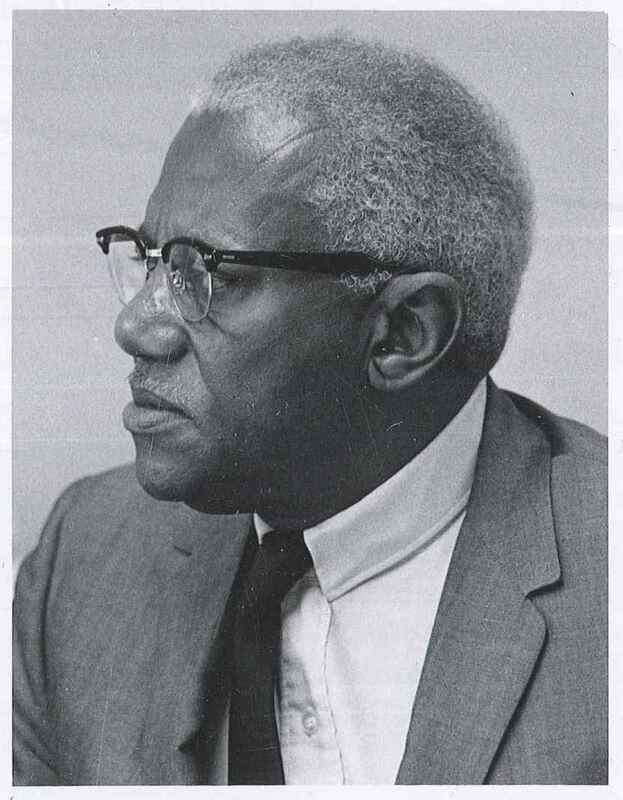 While Dr. Thornton was not an instructor at Central, he made an impact on the many students who took part in the black studies programming he helped to establish. In 2019, the 50th anniversary of his visit to our university, we reflect on Dr. Thornton’s groundbreaking tenure at Central. His contributions to physics, academia, and our society serve as an inspiration to academic pursuits here in Mount Pleasant and beyond. 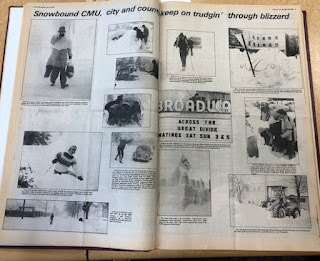 Yesterday, we posted a piece about historic campus shutdowns that we found via the digitized historic campus newspapers (and you can read all of the CM Life and the yearbooks via CMUHistory.cmich.edu!). 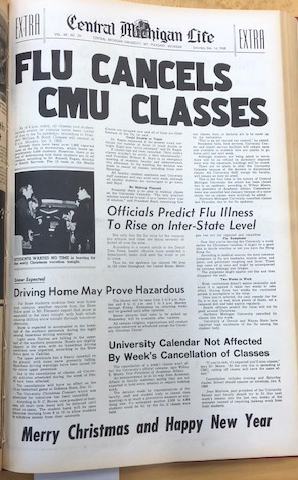 In our haste to journey back in time to the Great Blizzard of '78 and the flu epidemic of 1968, we skipped two major campus closures. 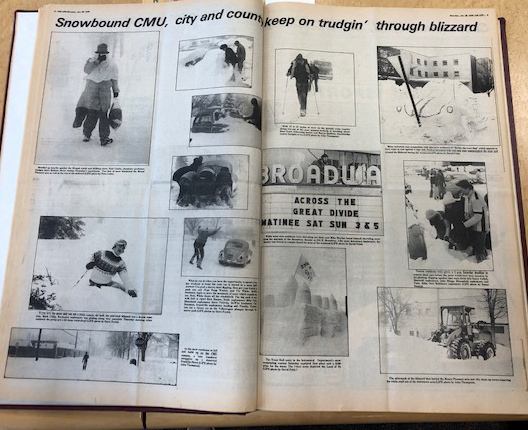 Thanks to members of the CMU Alumni for remembering these extended "vacations," as CM Life referred to them. First up, Monday, March 4, 1985. 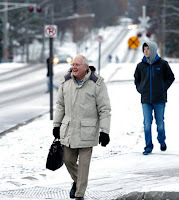 That day, a snowstorm passed through Mount Pleasant and brought campus operations to a standstill. Just one week before spring break, students got an extra vacation day. From the reports, it seems like everything would have been up and running the next day and students would finish out the week before heading to Panama City or Daytona... or Lansing. But at 7:00 am Tuesday morning, a lightning bolt struck near Foust Hall and sent a surge of electricity through campus. Most campus buildings lost power and campus was closed for another day. Repair crews worked like mad, but the power was still out for most of campus on Wednesday as well, and campus remained closed. At that point, President Harold Abel met with other campus administrators and decided to cancel classes through the end of the week. 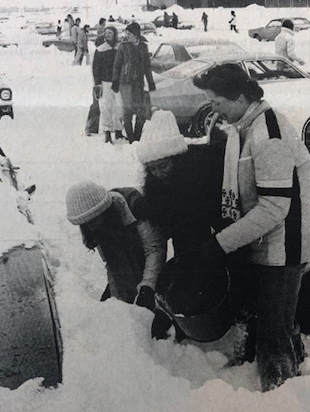 For CMU students in 1985, spring break started a week early. It wasn't until Friday, March 8th that the power was completely restored. With the university closed, followed by spring break, CM Life's first opportunity to report on the less-than-fired-up campus wasn't until the week of March 18. 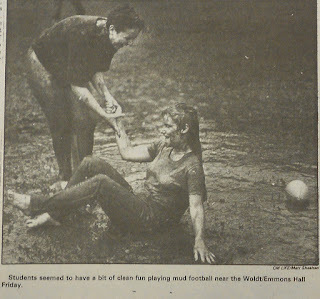 Just 18 months later, in September 1986, another storm brought campus to its knees. This time, it rained and rained... and rained. From September 9 to 11, it rained nearly 12 inches! Because the campus was inundated and the campus power infrastructure was damaged, University administrators cancelled classes on Thursday, September 11 for two days. University staff members thought they would be able to assess the problems by Friday and have everything back up and running for classes the next week. But that wasn't the case. Campus staff couldn't access the power system until Monday. Then, it took another two days to fully restore power to the campus. In total, students were given five days of "vacation." We appreciate the memories of Central alumni who fill us in on the stops we missed on our journey back in time. Yesterday, we mentioned that today's students join the ranks of those who survived the Great Blizzard of '78. Today, we can add to that those who survived the Not-So-Fired-Up power outage of '85 and the Flood of '86.